South Africa’s government-allied and major trade union federation, the Congress of south African Trade unions (COSATU), embroiled in its destructive feuding, has been fairly quiet on this issue for some time. But, over the past decade or so, the federation has indulged in rhetorical flourishes and occasional, symbolic, border blockades that received some publicity, but no practical results. This is, in fact, one of the arguments raised by those members of COSATU unions who now doubt if the linkage of their organisations with the governing African National Congress (ANC) was of any real use. There is broad agreement that, in the earlier years, some gains were made in terms of the labour laws. But even here there are arguments about whether this might have happened even with COSATU outside of the alliance. The question then arises: does this matter to South Africa? And the answer is unequivocal: of course it does. And not just on a moral plane. If Swaziland erupts, the consequences for South Africa could be extremely serious. So it is not just a moral question of doing the right, democratic thing. It is also a matter of self-preservation, of retaining as much equilibrium as possible within the region as the struggle continues to seek a better future for all. Could it be because of close ties at an elite level? 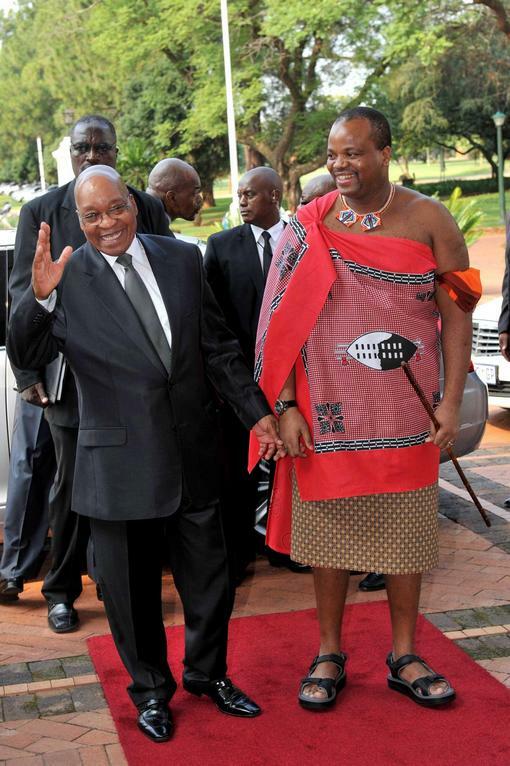 President Jacob Zuma, for example, is engaged to one of Mswati’s sisters, and Mswati is the brother-in-law, twice over, to King Zwelithnini of the Zulus. Nelson Mandela’s grandson, Mandla, has also married into the Swazi royal family. Such revelations, especially against the background of Zwelithini recently having his government grant increased to R57.6 million a year, gives cause for concern. As a result, labour activists have every right to ask whether the “beacon of hope and democracy” is being dimmed by the acceptance of autocracy and so-called traditional cultural values.